Jan 27/8th - GCR Winter Gala - ROTHLEY SHED, TPO VEHICLES and BEAVERTAIL all open for viewing at Rothley throughout the weekend. The TPO includes the sorting carriage and extensive postal museum normally only seen as a blur at Quorn. The Beavertail interior is nearing completion and this will be the final opportunity to inspect it before it enters normal service. January 27th (evening) - RVP ANNUAL MEAL - location to be confirmed (Loughborough area). Please e-mail (above) for details of our annual meal. Advance booking needed. April 2006 - (exact date to be confirmed shortly) - BEAVERTAIL RE-LAUNCH - the conclusion of our three year project to restore this historic coach to use. Subject to final agreement with the GCR the first runs will be for major donors, followed by use in regular GCR service. July 28/9th - Mail By Rail - Our TPO vehicles doing what they were designed for! MERRY CHRISTMAS! and a Happy New Year to all who take an interest in our work. Your continued support is much appreciated and this website will reflect at least as much progress in 2007 as it has this year! Update added to the BEAVERTAIL page. POSSIBLE E-MAIL DISRUPTION - The e-mail address used throughout this site (darren@rvp-ltd.fsnet.co.uk) has ceased working. Please use rvp_ltd@btinternet.com instead and disregard any automatic links from the site. If you have sent an e-mail in the last month please re-send as it won't have been received. RVP - THE MOVIE! - You've seen the website, read the news and probably seen the vehicles in action, now watch the film! GB Productions were with us throughout the Summer gala and have produced an 83 minute long DVD entitled "Rail Mail". The film follows the operation of the TPO vehicles during that weekend with comprehensive coverage of the mail exchanges from the lineside and on board the train. It concludes with a look at the mail vehicles in action with various locos over the past ten years. If you've seen the mail exchange for real this is a great reminder. If you've never seen it then this will show you what you've missed. BEAVERTAIL RUNS! - 1719E successfully completed its "preview" appearance at the Steam Railway Gala. Starting with the 10:00 from Loughborough it completed 13 round trips during the gala with no mechanical problems. It created a great deal of interest from gala visitors with one notable line up of Photographers on the Sunday afternoon at Quorn all facing the wrong way and taking a picture of the back of the train! Inside a sales stand and display boards did a good trade and successfully raised funds for the seats. Members of the public could not be carried while on the move because of the lack of proper seats, however the use of garden chairs(!) did allow a few members of the restoration team to sample a preview. We can assure you the view is superb and are very confident it will be a great addition to the GCR when it enters service next Spring. Further updates over the winter as this project draws to a successful conclusion. In the meantime some photographs of the weekend are on the Gallery page. Meanwhile, elsewhere on the railway the two TPO vehicles operated five mail drops without problems during the gala (all with 45305 as motive power). Back at Rothley our repaint job for "Renaissance Railcars" was completed - their stores van 96187 now looks like this. 1719E had the final adjustments made to its spring settings this morning and is therefore fit to run during this weekends gala. This picture shows it back where it should be - on the back of a train! (at Loughborough this afternoon). Its debut appearance on a passenger train will therefore be the 10:00 from Loughborough on Saturday (and then every trip formed by the "RB" set). Visitors to the gala are welcome to view the coach internally while the train is stationary at Loughborough and Lecicester (and watch the loco run round from an unusual angle! ), but because of the lack of seats passengers will be asked to return to normal carriages for the journey itself. The full launch (with seating) will be on a date to be announced next Spring, but in the meantime we hope you enjoy this preview appearance! Clearly this is big news and marks a very major step forward on our major project to get these historically important vehicles back in use. It represents the outcome of over £55,000 in funding and three years work (mainly by contractors, but virtually all undertaken at the GCR). The trips this weekend are part of the running in program for the vehicle following its complete mechanical overhaul- and we acknowledge the assistance of the GCR's staff at Rothley in getting the vehicle to this stage. BUT - and its a big but! - it will not be finished!. We are lacking one major item - the seats! There will be a final fund raising push during the gala - the Beavertail will be open for viewing and visitors will be able to get a taste of what a ride in it will be like, but we will be seeking 20 donations of £100 in a "sponsor a seat" appeal. Exact details that weekend but the GCR will offer an incentive in return for a donation of this size. We are confident the appeal will quickly reach its target and we'll buy seats over the winter. The final interior fitting out will also be completed and a full launch into normal service will take place in the spring. Do come and see the considerable progress made on this project - See how the cash which many of you provided has been spent! See the BEAVERTAIL page for full detail of the project. The repaint of our workshop van, CCT 94707, is now complete and it now carries full "Tartan Arrow" livery. This was a livery used on some CCTs used on Anglo-Scottish parcels traffic in the 1960's. While 94707 did not carry this livery in the past it is an accurate recreation of a lost livery appropriate to this type of vehicle and (as far as we know) the only vehicle in preservation carrying it. Our repainting team now move on to another project, this time to assist our colleagues in "Renaissance Railcars" (owners of the class 101 DMU vehicles on the GCR). Their stores van 96187 requires a repaint to make it more suitable for use on the GCR, and we are happy to assist. The picture shows its current state, I'll put the finished article up in a few weeks. Meanwhile further update added to the BEAVERTAIL page. Update added to the BEAVERTAIL, and Nunckley Hill project pages. ORIGINAL MOUNTSORREL BRANCH ENGINE AVAILABLE! - It has brought to our attention that an original industrial shunter which worked on the Mountsorrel branch is currently being offered for sale. Peckett 1759 "Elizabeth" was built in 1928 and worked at Enderby until 1957. However it was then transferred to Mountsorrel and would therefore would have worked on all / part of the branch which now forms the centre of our Nunckley Hill project. It remained there until the end of rail activites at the quarry site, and closure of the branch, in the mid sixties. 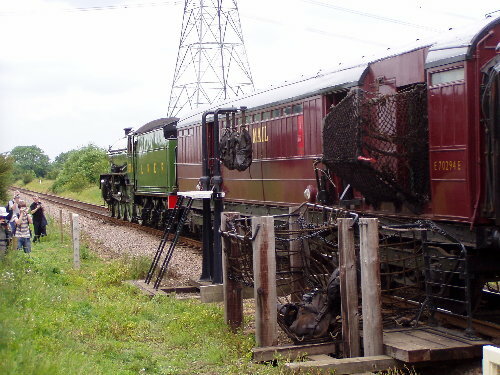 The idea of shunting the revived branch with an orginal shunter is certainly one which appeals to us. However RVP no longer have the resources to maintain steam locomotives so we can't take ownership of it ourselves. We would be delighted to hear from anyone interested in purchasing the loco (or mounting a bid to do so) and would certainly seriously consider the basing of the loco on the restored branch. Anyone interested?. MARK 1 TPO's ARE BACK! - The break in web updates has been unfortunate with the most newsworthy event we've done for some time taking place in the interim. Mk1 TPO 80301 successfully dropped mailbags throughout the July 29/30th GCR gala. 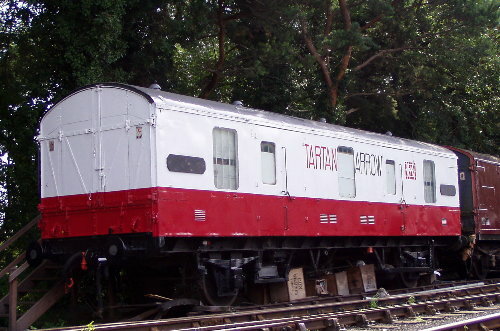 It therefore became the first Mk 1 TPO to exchange mail on the move since October 1971. Given the gap in reporting here I can do no better than refer you to our colleagues at the Nene Valley website HERE giving a report and photographs. Pictures will be added to our gallery shortly. If you visited the gala we hope you enjoyed the show. Many thanks to our volunteers (and donors) who did so much to ensure this little piece of history could be (re)created. More generally our "1V86" appeal (see below)is making good progress with a deposit now placed on a sorting vehicle. We urgently need more funds to complete the purchase and allow the fitting of nets on 80301. Mk1 TPO 80301 now has a full set of traductor arms fitted and has moved to Quorn pending a test run to check it is in gauge past the exchange equipment. 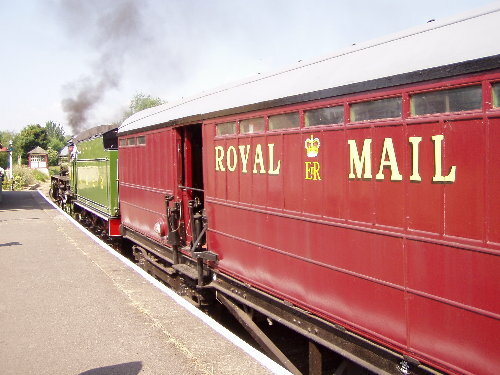 Assuming all the calculations and measurements are proved correct it will drop mail bags at speed for the first time since 1971 during the forthcoming GCR "Mail by Rail" gala on 29/30th July. This event will feature at least four mail exchanges each day using both of our TPO sorters. Full details on GCR website - see Contacts page. This GCR gala will centre around four high-speed mail exchanges each day, For the first time since 1971 a Mk1 TPO (80301) will be dropping mail bags at speed. Both it and LNER 70294E will be in use with the usual variety of motive power on offer at the GCR. Further details nearer the time or from the GCR website (see contacts page). This picture shows 80301 complete with its four new traductor arms at Rothley this week. All that remains prior to the gala is a test run (see also appeal below to fund further work on Mk1 TPOs). 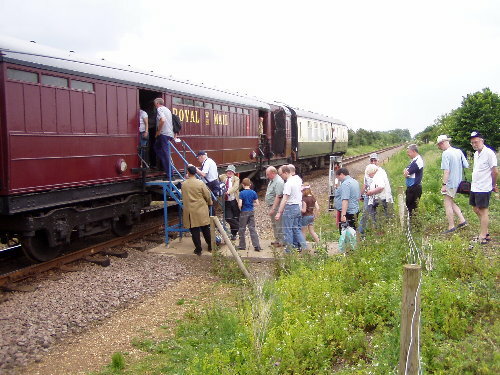 RVP volunteers needed to man the TPO trains during this gala - please contact Darren or Tim if you can help us out. There will also be a social event on the Saturday night - accomodation can be found in loughborough for our further flung members - please contact Tim ASAP. Elsewhere work has continued to make good progress on LNER buffet car 24278. This picture shows it in Rothley shed with upper panels varnished and in place, and alongside identical sister 9124E. The bottom panels for it were retrieved from store last week and will be fitted shortly. 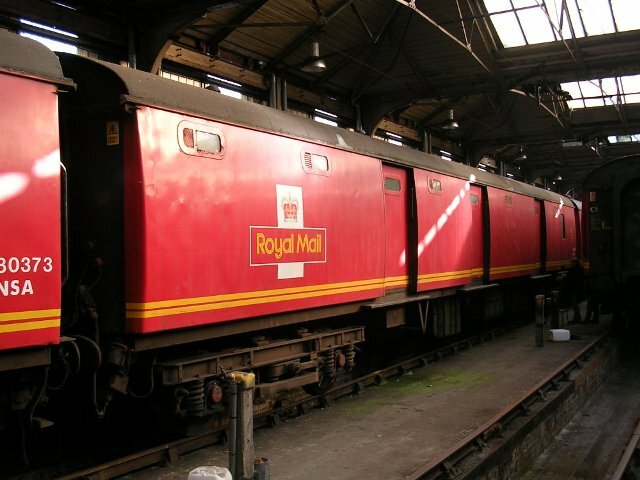 RVP has launched a new appeal specifically to fund the preservation and recreation of a train of Mark 1 Travelling Post Office vehicles. 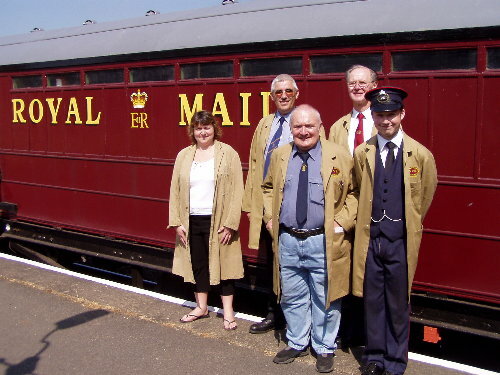 RVP has operated preserved TPO trains for the past 24 years, in the form of the unique LNER 1937 built Travelling Post Office set which regularly provides the spectacle of a high speed mail exchange on the Great Central Railway. six years ago a 1959 built Mark 1 vehicle, 80301, was placed in RVP's care and restored to its original livery. It was always the intention to add an appropriate stowage tender to the collection and two RVP members duly acquired vehicle 80458 from EWS in January. This vehicle, now also on loan to RVP, will arrive at the GCR shortly. Work is therefore well advanced on this project. 80301 is now having exchange equipment refitted to enable it to drop mail bags. This work is progressing well as these photographs show. The project is being taken forward by RVP Director Tim Pryce, with Paul Harrison and Mick Yates (who also own 80458) providing the engineering skills for drawing and manufacture of parts.Now an appeal has been lauched to add at least another one (maybe two) vehicles to the Mark 1 TPO set to make it fully representative of mail trains of the 1960 to 2004 period - the final chapter of main line TPO operation. The next vehicle to be added is sorter 80349 (the same basic type as 80301 but of the later batches with design changes). 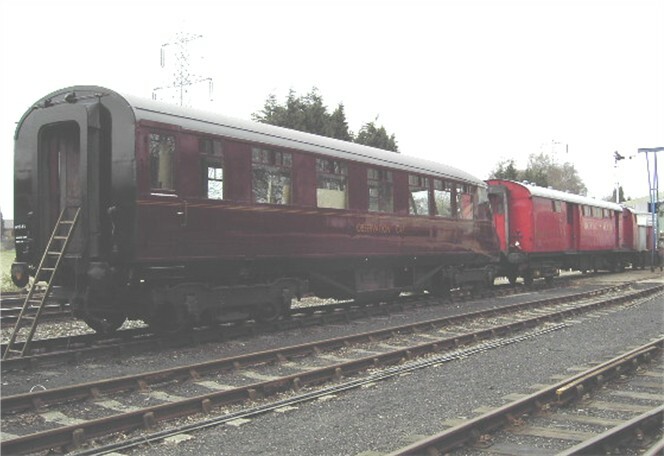 It is intended that this will join the other vehicles on the GCR in due course; negotiations to find a space for it on the line are taking place.To purchase this vehicle we need to raise £4000 immediately, plus additional costs for refitting vacuum brakes. The initial appeal total is therefore £6000. Ownership of the additional vehicle will be with RVP, a registered charity ensuring its future in active preservation. This also means donations qualify for gift aid adding an additional 28% to UK tax payers donations (at no extra cost to the donor). All monies raised in this appeal will only be applied to the preservation and operation of the mark 1 TPO vehicles in our care. 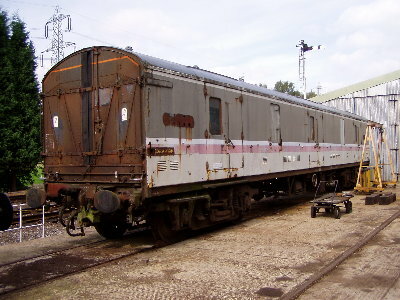 PLEASE MAKE A DONATION - this is the last oppportunity to acquire these vehicles before they are scrapped.Donations can be made by sending cheques payable to "Railway Vehicles Preservations Ltd" to 9 O'Grady Square, Leeds, LS9 8NJ. Please write 1V86 appeal on the rear of the cheque. UK tax payers please also complete and enclose a gift-aid form, available on this website or by post from the address given. The repeat visit of our TPO sorter carriage 70294E to the Nene Valley Railway took place last weekend. As ever this well organised event was well attended with the four daily TPO demonstration runs completed successfully. Locos used this year were 1306 and 73050. 70294E returns to the GCR today, ready for use on the GCR on 28/9th July. Updates are a little scarce at the minute because of a house move. However work continues on all projects, with the Beavertail's progressing, the Nunckley Hill project plannning application being prepared for resubmission, and ongoing restoration work on 24278. In addition exchange equipment fitting on TPO 80301 is progressing well. Full details and pictures hopefully within two weeks. 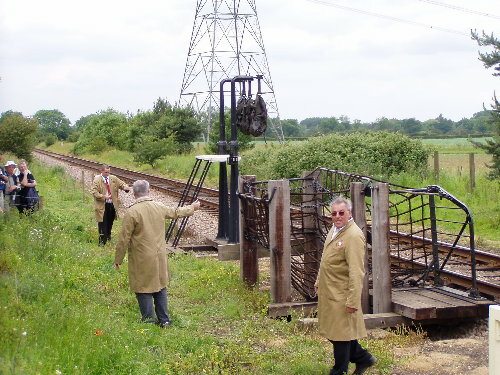 In the meantime don't forget the visit of the LNER TPO to the Nene valley on 17/8th June. UPDATE - work continues on 24278, such that the upper panels on one side are now largely complete. These have had to be made from reclaimed teak - a very long and difficult process. Work continues on the end framing, and then the other side before fitting of the new lower panelling. FINAL CALL for our dining train booking on the 3rd June - anyone else inteding to come let me know now. WORK WEEKEND on 3/4th June at Rothley will see the painting of Motorail van 96202E - volunteers welcome. Mark 1 TPO 80301 is now having its exchange equipment fitted. Keeping it company in Rothley yard is Beavertail 1719E. 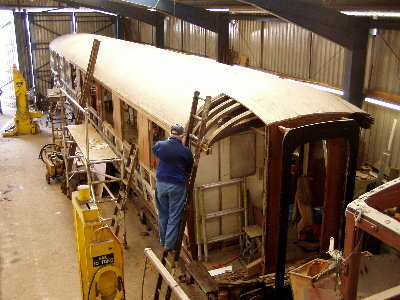 Work continues on buffet car 24278 in Rothley shed. 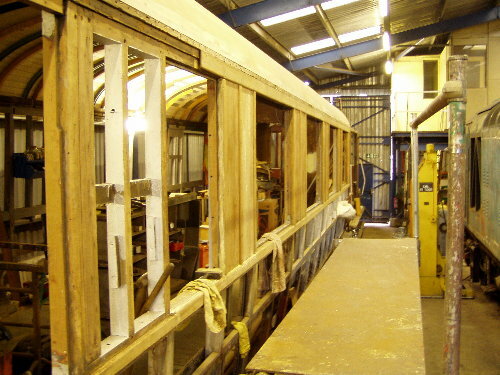 It is now having panelling fitted to the upper bodysides. Each panel is being made from teak recovered from other vehicles. This is a labourious process which is taking a considerable amount of time, but is necessary in view of the very limited supply of new teak panelling. It goes without saying we'd welcome offers of unwanted teak if anyone has a shed full! PRESS RELEASE:BEAVERTAIL PROJECT: NOW THERE ARE TWO! 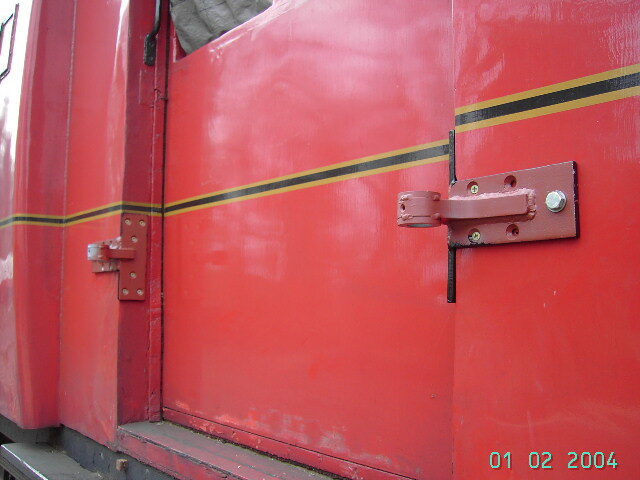 Railway Vehicle Preservations, the historic carriage restoration group based on the GCR and who are shortly to successfully complete the restoration of BEAVERTAIL observation car 1719E, today announces that a new agreement has been reached that will see the other Beavertail car (1729) also restored to running order. 1729 has been in long term store at Carnforth, but RVP Trustee Gordon Maslin has been negotiating its purchase for some time. The vehicle has now passed to RVP under an agreement which will see an RVP member fund its subsequent full rebuild. The project, and future use of the vehicle, will be managed by RVP Ltd.Detailed examination (and removal of asbestos) has already taken place and a schedule of work is now open to tender. 1729 is to be restored to its original 1938 condition with the original sloped end. It will be outshopped in the striking blue 'Coronation' livery. 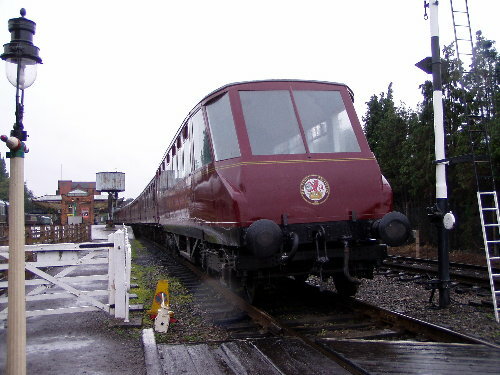 This will be the ideal complement to 1719E which is being restored to its 1960 condition with modified observation end. In this way both phases in the life of these historic vehicles will be represented.Once complete 1729 will be available for use on suitable preserved railways. RVP's existing appeal for 1719E guarantees its use on the Great Central Railway once completed. The operating base for 1729 is to be determined as restoration proceeds, but the possibility exists of bringing the two together on the GCR at some point in the future.While the rebuild of 1729 will be privately funded RVP's Beavertail appeal remains open. To ensure the rapid conclusion of 1719E's rebuild a further £2,000 needs to be raised to conclude the interior work. Full details of the progress of this project is on www.rvp-ltd.co.uk. Donations should be made payable to RVP Ltd and sent to 22 Grange Street, Burton On Trent, Staffs, DE14 2ES. 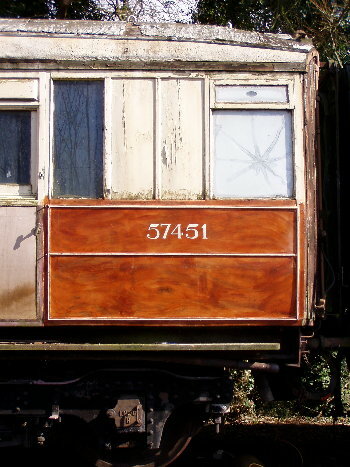 Signifcant progress is now being made on the ongoing major restoration of buffet car 24278. This is now seeing teak panels prepared for the bodyside as well as renewed activity on the complicated carpentry necessary to complete the end. Meanwhile out in the yard a surprising development - long term storage candidate BTK 57451 has been receiving attention to make it more presentable. This was originally intended to be a quick repaint, but this has now become a practice vehicle for the scrumbled paint effect the LNER used on certain metal bodied coaches in the 1940's. The end result is quite impressive (given that it is on top of poor quality plywood). The first two panels have been completed and our volunteer expects the result to get even better as he continues to do the rest of the vehicle! Updates added to the BEAVERTAIL, and Nunckley Hill project pages. The Mk1 TPO sorter 80301 has moved to Rothley for the fitting of exchange equipment. Traductor arm components have been made elsewhere and will be fitted over the next four months. Meanwhile our stores CCT continues its repaint into a surprise new livery (deliberately not showing pictures of progress on this!). In the shed 24278 is seeing continuous activity on the top side panelling and the frame repairs at the North end. Work on the Beavertail continues with a full update to follow in due course. Updates added to the BEAVERTAIL and BTK pages. The LNER TPO set operated as planned last weekend, with no problems on any of the four drops and large crowds at Quorn. Following this the Mark 1 TPO 80301 is to be moved to Rothley next week for assessment prior to the fitting of traductor arms for mailbag dropping. It will be joined in due course by newly acquired Brake tender 80458 - the loan agreement for which was signed at our annual meal on Saturday night. 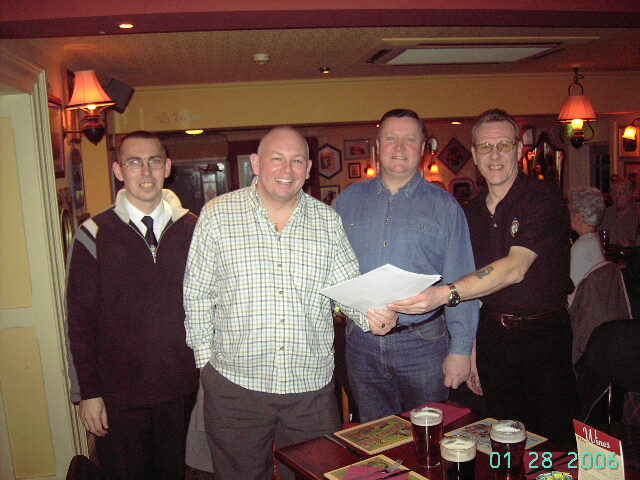 The photo shows (from right) owners Mick Yates and Paul Harrison taking the agreement from Bob Hall (who previously maintained them for Royal Mail), with RVP board member Tim Pryce officating. TPO TRAINS THIS WEEKEND - The LNER TPO set is in action this weekend, performing two mail exchanges at Quorn each day at 11:56 and 16:11. There should also be the opportunity to view the interior of the sorter and postal museum for a short period at Loughborough Central before and after each trip. Those booked for our annual meal on Saturday evening this is at 7:45pm at the Toby Carvery, Forest Road, Loughborough. Anyone who asked for accomodation to be booked for the night should have been contacted by now; if not contact Darren. EWS have confirmed acceptance of the bid made for Mk1 Brake Post Office Tender No.80458. This is being purchased by two members and then placed on long term loan to RVP. The vehicle currently resides in Euston Carriage shed. It will need to be moved by rail to a loading point (probably with the other 5 TPO vehicles secured for preservation by other railways). Road transfer will then be made to the Great Central where it will join 80301 to represent 1960's mail trains; essential in completing our collection of TPO vehicles and the perfect compliment to the fully operational 1930's LNER TPO set. 80458 was built in 1967, and therefore becomes the youngest member of our collection. It represents the final development of TPO vehicles, with the smaller windows fitted after the 1963 train robbery. Originally built in Blue/Grey livery it currently carries the bright Royal Mail red livery of recent years. It is likely to retain this livery for a short period while work progresses on fitting vacuum braking. In due course it is expected it wil be restored to 1960's Royal Mail red - actually non authentic but matching 80301 and more appropriate to the GCR's period. We wish to record our thanks to Mick Yates and Paul Harrison in ensuring we were able to make this important addition to the collection. Update added to the BEAVERTAIL page. HAPPY NEW YEAR! = RVP's ANNUAL MEAL will take place on Saturday 28th January at the Toby Carvery, Forest Road, Loughborough at 7:45pm - cost to follow (less than £10). This is the weekend of the GCR Winter Gala at which the TPO set is expected to be in use. Further flung members who wish to stay in Loughborough also contact me - I'll make a hotel booking nearer the time.